The haulage industry is vitally important to our economy as it is essential to move products and goods from one location to another. Our export industry relies heavily on the haulage industry also and without it, well the country would surely come to a halt. For it to run smoothly as possible, there are a number of contributing factors that keep the cogs turning and with so many different types of haulage to deal with, this is not an easy task. Refrigeration work generally involves the transportation of foodstuff and in this area time constraints are greater than any other area of haulage work. Hauliers working in this area have to have their refrigerated trailers and tankers in excellent condition as well as being well maintained. To ensure this is the case, they trailers and tankers are regularly serviced by highly trained professionals. 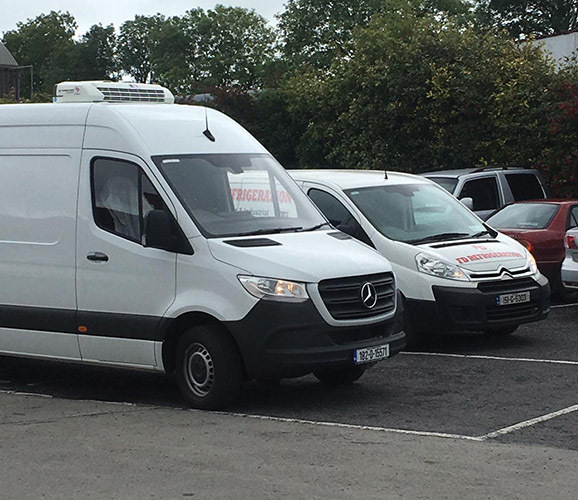 For this month’s edition of Irish Trucker we profile Galway based FD Refrigeration Ltd, a family run business that specialises in refrigeration and electrical work for the transport and industrial sector. FD Refrigeration was established in 1998 by Francis Donnellan who brought a wealth of experience to the role as he had worked in refrigeration for many years before hand. Francis made a decision early to ‘not get too big’ and it is a decision that has stood him in good stead over the years as he has built up a loyal customer base, many of who have been with him since he started. For the last number of years, he has been joined in the business by his son Finbarr who spoke to us about the services that they provide and the great lengths that they go to ensure that their customers are always satisfied. Finbarr revealed that they are very much a nationwide company which sees them go to jobs in any part of the country. “The nature of the work means we could be in any county. We do all the work for the likes of Arrabawn Co-Op, Corrib Foods, Midland Fine Foods and BWG to just name a few. Not only does Finbarr and his father cover the length and breadth of the country, but they generally have to do it at unsociable hours also.